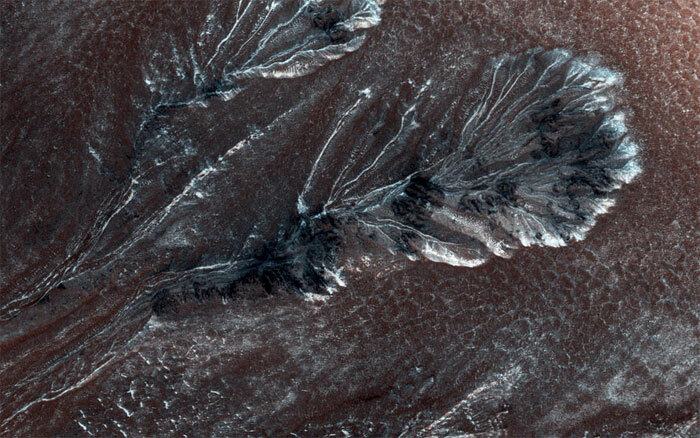 Seasonal frost commonly forms at middle and high latitudes on Mars, much like winter snow on Earth. However, on Mars most frost is carbon dioxide (dry ice) rather than water ice. This frost appears to cause surface activity, including flows in gullies. This image, acquired on April 11, 2015, by the High Resolution Imaging Science Experiment (HiRISE) camera on NASA's Mars Reconnaissance Orbiter, shows frost in gully alcoves in a crater on the Northern plains. The frost highlights details of the alcoves, since it forms in different amounts depending on slopes and shadows as well as the type of material making up the ground. Rugged rock outcrops appear dark and shadowed, while frost highlights the upper alcove and the steepest route down the slope. Most changes associated with gullies are observed in the Southern hemisphere. However, some are seen in the Northern hemisphere, where steep slopes are less common. HiRISE is monitoring these gullies to look for changes and to understand the behavior of the frost.